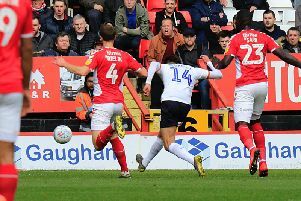 Luton boss Mick Harford slammed a crucial penalty decision as a 'disgrace' as it kick-started Charlton’s comeback against his table-toppers who lost for the first time in 29 Sky Bet League One matches. Harry Cornick had put Town in front after 15 minutes but early in the second half the Addicks were awarded a spot-kick when Lyle Taylor went to ground without much contact from Sonny Bradley. The striker converted the penalty and then scored the third, two minutes after Igor Vetokele had made it 2-1. It was Town’s first defeat in exactly six months and Harford said of referee Gavin Ward’s decision for the equaliser: “The penalty is an absolute disgrace in terms of what has been given, in terms of the contact that was in the box. In my opinion it changed the face of the game. Town were comfortably second best after half time and Harford, who was awarded the league one manager of the month award in the week, said: “It was chalk and cheese in the first half and second half. It was also Harford’s first defeat in his second spell as Town manager, 10 years to the day that he was in charge when Luton were relegated out of the Football League. This result won’t feel anywhere near as desperate as that day, as the Hatters are still top of league one and five points clear with four games to go off the back of a record-breaking 28-game unbeaten streak.